Abbey wasn’t here last week, but thank the sweet baby Jesus she is back! I’ve missed her. But a huge shout-out to all of you who linked up last week with me. (Jaime, Kate, Meg, & Amanda : You guys make me a better blogger. You really do.) I was seriously worried it would just be me by my lonesome. I started Insanity (I’ve done it 3 times this past week – which I’m considering fantastic since it was a 3 day weekend). I had hoped the husband would join me but instead he just comments on how much more sweaty I get with this than I ever did with Jillian Michaels 30 Day Shred. I took measurements to start out with Insanity and compared those with what I took when I started the 30 Day Shred. It looks like I’ve lost 1.5 inches from my hips and 1 inch from my waist. That was only doing 20 out of the 30 days. I’ll take it! So, if you’re in the market for a workout DVD – I would totally recommend it (it’s also much, much cheaper than purchasing Insanity). If I would have done those days consecutively and then, you know, actually make it to the 30 I have no doubt that I would have seen even better results. Maybe I’ll try again in a few months. We shall see. Lately I’ve felt kind of burnt out with exercise but then I did something awesome this weekend and now I know what the real issue is. For the past couple months I’ve tried branching out to other forms of exercise and in the process I’ve stopped running (with the exception of a couple races). I wanted a break from the constant training I had been doing since August of last year and I was excited about it. It’s been a nice change but I’m over it. I miss running. Something about it soothes me. Anyway, this weekend I participated in a mud run (race recap soon!) and it was hard. Not only did we have mud holes, belly crawls, and obstacles of all sorts to go through – we chose to run the entire time (when possible. I mean, running on mud isn’t the easiest thing to do my friends). It wasn’t a timed event and a lot of people were walking from one point to the next, but we didn’t, and I’m glad. My legs felt happy. It’s weird to explain but I’m sure there’s someone out there that understands. It means I need to start running again. I don’t want to wait for August (my initial plan was to start up again for the fall running schedule I have planned). 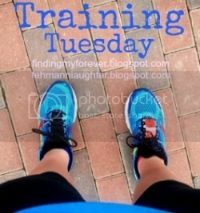 I’m not giving up Insanity – I just think I’ll cut back to 3-4 days a week for that (the program calls for 6 days a week) and add 1-2 days of running – a happy medium. so jealous of you guys, I want to do a mud run so bad!! Hi! New follower! I know exactly what you mean about running being soothing! When I can get myself out there, it's so cathartic. I enjoyed linking up with you today!! Running is awesome! As much as I'm starting to love my bike (you can go sooooo much faster! ), I don't think I could ever give up running completely, unless I had to. Girl, I am all about a happy medium. I think I may try to do 30-day Shred in June (the whole month? Or at least most of the month since I'll be traveling at the end) but still run a few days a week. We shall see. I've never found that happy medium myself. I know EXACTLY what you mean about your legs feeling happy. I was only able to run once before vacation, and I feel like I really just NEED to go only 3 days into my trip! Heck yes I know what you mean about happy legs! I'm really impressed you're doing Insanity. I don't think I have the dedication to do it...I can't even get past 10 days on the Shred!!!! So, YOU GO GIRL! I miss running, too. I need to start back again once my life slows down at the end of this month because I'm going to train for another half in September!! !